The linkage on the Port drive must be switched at the forward control lever ( cockpit ) to make it shift into reverse when the lever is placed in forward. The propeller must be changed to a left hand prop. Most boats, with twin drives, made after 1991, and have Alpha One/Generation II drives, already come with a counter rotation drive on the Port ( or left hand side of the boat when viewing it from the rear ). 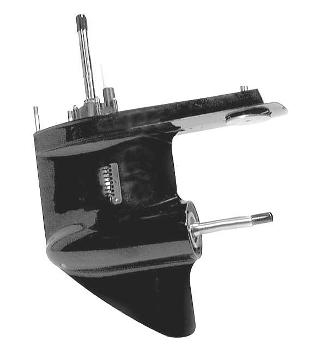 Counter-rotation lower units are only manufactured by MerCruiser. There are no aftermarket replacements for these units. These lower units have 13 teeth on the top of the vertical shaft and will not fit older units made before 1970 which have 8 teeth. ( with a left hand prop installed ). A counter-rotating lower unit does not have any in & out end play on the propeller shaft. A standard rotation unit has between 1/16 to 1/8 of an inch of in & out end play.